We first break this down into a simpler problem. Standard MST algorithms for general graphs (e.g., Prim's algorithm) can compute the MST in O((E + N) log N) time for E edges. If we can exploit geometric properties to reduce the number of edges to O(N), then this is merely O(N log N). In fact we can consider, for each point P, only its nearest neighbors in each of the 8 octants of the plane (see the figure below). The figure shows the situation in just one of the octants, the West-Northwest one. 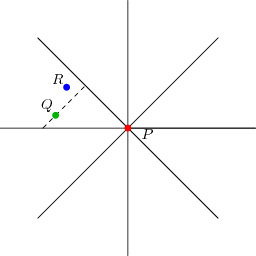 Q is the closest neighbour (with the dashed line indicating points at the same Manhattan distance as Q), and R is some other point in the octant. If PR is an edge in a spanning tree, then it can be removed and replaced by either PQ or QR to produce a better spanning tree, because the shape of the octant guarantees that |QR| ≤ |PR|. Thus, we do not need to consider PR when building the spanning tree. This reduces the problem to that of finding the nearest neighbour in each octant. We'll just consider the octant shown; the others are no different and can be handled by symmetry. It should be clear that within this octant, finding the nearest neighbour is equivalent to just finding the point with the largest value of x − y, subject to an upper bound on x + y and a lower bound on y, and this is the form in which we'll consider the problem. Now imagine for the moment that the lower bound on y did not exist. In this case we could solve the problem for every P quite easily: sweep through the points in increasing order of x + y, and Q will be the point with the largest x − y value of those seen so far. This is where the divide-and-conquer principle comes into play: we partition the point set into two halves with a horizontal line, and recursively solve the problem for each half. For points P in the upper half, nothing further needs to be done, because points in the bottom half cannot play Q to their P. For the bottom half, we have to consider that by ignoring the upper half so far we may have missed some closer points. However, we can take these points into account in a similar manner as before: walk through all the points in x + y order, keeping track of the best point in the top half (largest x − y value), and for each point in the bottom half, checking whether this best top-half point is better than the current neighbour. So far I have blithely assumed that any set of points can be efficiently partitioned on Y and also walked in x + y order without saying how this should be done. In fact, one of the most beautiful aspects of this class of divide-and-conquer plus line-sweep algorithms is that it has essentially the same structure as a merge sort, to the point that a merge-sort by x + y can be folded into the algorithm in such a way that each subset is sorted on x + y just when this is needed (the points initially all being sorted on Y). This gives the algorithm a running time of O(N log N). The idea of finding the closest point within an angle range can also be used to solve the Euclidean MST problem, but the O(N log N) running time is no longer guaranteed in the worst cases, because the distance is no longer a linear equation. It is actually possible to compute the Euclidean MST in O(N log N) time, because it is a subset of the Delaunay triangulation.